This blog is going to carry over a couple of busy days from me. Thursday I was invited to represent and promote triathlon at the Commonwealth Games Activation at Soutbank, Brisbane, with Jess Ashworth and Emma from Triathlon Queensland. We ran the Trystars Kids Triathlon and had a great time, before packing up and heading down the coast with Jess for the two days of racing at the Gold Coast Jewel Triathlon. 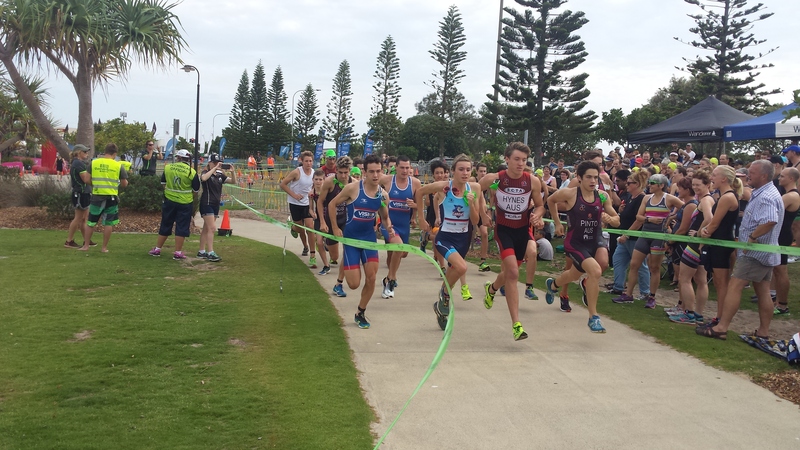 Race briefing was Friday afternoon at a hotel in Surfers Paradise and we were given our access passes and had a quick team meeting to decide when and where to meet. With NSW and their daylight savings, I had to wake up 1 hour earlier and left around 3am, with dad driving, and myself going back to sleep. After waking up for the second time I ate some creamed rice and arrived at Kingsclif. It was still dark, luckily I brought my bike light to ride to transition. Racking was in number order, and my rack was around the basketball courts, behind the toilet, and on a little mound. This little mound made my bike too high to fit under the rack, so I had to rack by my bars. I came out and went straight into a warm up jog around half the run course. Being in Western Australia since Tuesday, we stayed in Fremantle and did general touristy stuff until Friday afternoon. That afternoon I turned up to the race venue and had a ride around the course before briefing. It was a sprint distance, draft legal event with a unique 2 lap swim, 3 lap cycle and 4 lap run. After briefing I went for a swim and then had a quick celebration of birthday cake for Jess before heading back to Fremantle for the usual pre-race dinner of lasagne and garlic bread. I had to be at the regatta by 6 am to check in my bike and watch the first race. After a 4hr drive I was keen to get out of the car and move around. I had a team meeting with Met East at 3pm along the Hervey Bay Esplanade, and was keen to catch up with everyone. Once the meeting was over I hung around for a couple of hours talking before walking down the beach to the Sharkie's for a swim. I dragged a scaredy cat out a couple of hundred meters to do some swimming and pace work before tomorrows race, or at least that was until something touched her foot. I headed back to my room for the usual pre race dinner of lasagna and garlic bread before an early night. My lead up to the national cross triathlon championships was less then ideal. Having barely ridden my mountain bike this year, and coming down sick two days before, I was ready. I think now would be an appropriate time to mention that I have only done one off-road triathlon prior to this. Ok, enough of my excuses, time to tell it how it was. Lying awake since 2:30 coughing and spluttering I was keen to get out of the house and do something. we made the drive to Ewan Maddock Dam in just under 2hrs and got a car park almost at transition. My weekend was off to a flying start, literally… The biggest downside of my weekend was watching the baggage handlers throw my bike onto the plane, and then I was soon off to sleep almost until our descent. Once off the plane I checked my bike, fortunately the only problem was a knock to the shifter lever which I could easily adjust. We caught a taxi to accommodation and I unpacked my bike. Thanks to the Sharks Triathlon Club for the loan of bike bag. That Friday afternoon was rather eventful. Saturday had a later start with transition opening at 10 and my first race starting at 2:30pm. Saturday consisted of two draft legal races, each at 400m swim, 9.5km cycle and a 2.5km run. The weather was rainy and miserable, so much for 35 degree heat. The heat that I had trained in and suffered through, only for it to be cool and wet on race day. I went for my warm up and couldn't seem to find any speed in my run throughs. I came back early and went for a longer swim warm up. With the Thursday evening being suit check and registration, it was rather social and relaxing. I checked into my room at 4pm, unpacked and then got to meet Ryan Fisher for a Q and A before dinner. I didn't sleep much that night, I don't know why, but I got 2 hours sleep, and was rather tired. Friday kicked off with transition opening at 8am for bike inspection, and racking, along with setting up for the aquathlon which would begin at 10:50 for myself. Being my local Triathlon, I didn’t have to wake until 5am, before eating my breakfast of wheat bix at home, and leaving at 5:30am. I went straight into transition as I had registered the day before, and was spoilt for choice on the opens rack, being the second person to set up. The distance was a 900m swim, 25km cycle, and a 6km run. I had my usual socialisation in transition with the mates before going to the sharks tent to find more people. I then headed back into transition to sort out rubber bands, and was talking before I suddenly got a feeling that I didn’t have my tri suit. The days start was rather late, with registration not opening until after 7.00am, my usual race preparation was a bit messed up. I put my stuff in transition, by stuff I mean towel as it was an aquathlon. The distances were 2.5km run, 1km swim, 2.5km run. I had a terrible start once the gun went, but worked up into the top few rather quickly.